The Inca drawbridge shows the fantastic architecture as an evidence of the skill and daring of the Inca builders which is located in the southeastern part of the citadel of Machu Picchu. During the tour, you can enjoy stunning views of the Urubamba Valley and the steps that Hiram Bingham continued to discover Machu Picchu. An Inca road will lead to the forest, where different species of flowering bromeliads and epiphytic orchids. The Inca Drawbridge it is a narrow path made of granite, which continues along two kilometers where after a curve is interrupted by a narrow drawbridge based logs. This particular bridge is one of the eight trails built by the Incas that lead into the city of Machu Picchu. 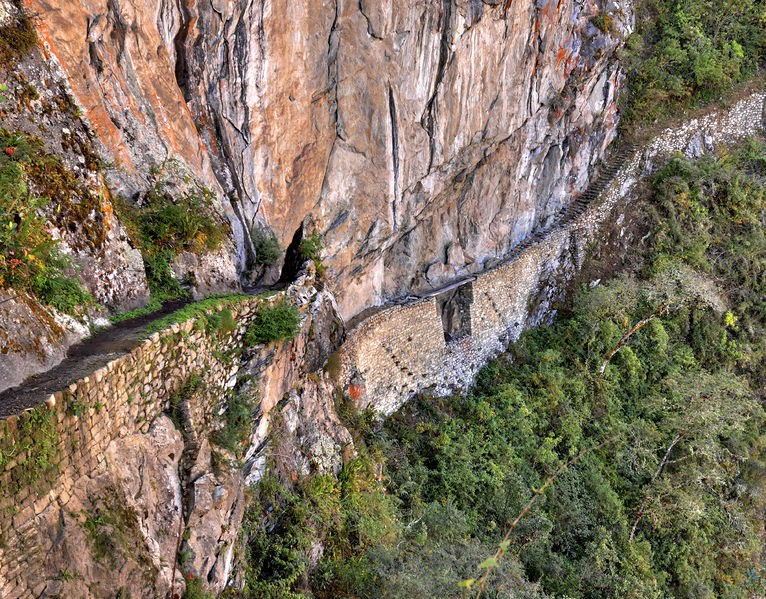 The Inca drawbridge below leads to an incredibly Exposed rock passage across a ledge in the middle of a rock wall vertically and is part of one of the most dangerous roads of the city and at the same time the most impressive.